The three magnificently dressed ladies were students at the Women’s Medical College of Pennsylvania, snapped at a Dean’s reception, in 1885. 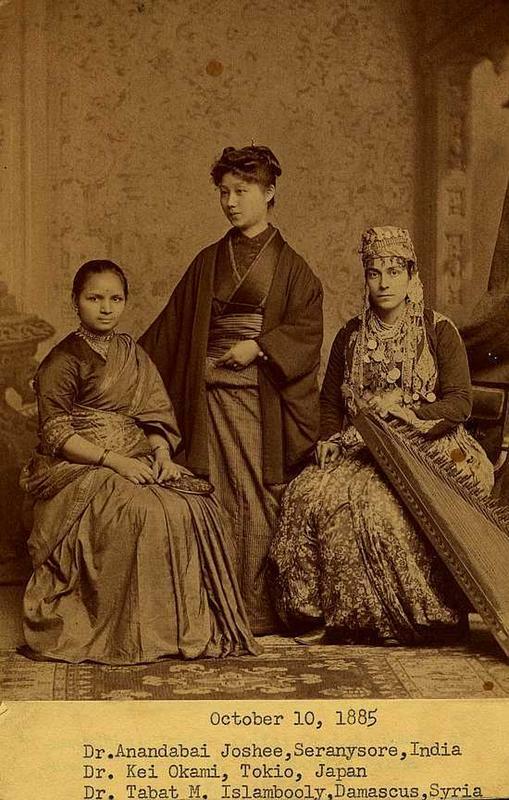 The three in the photograph — from left to right, Anandibai Joshi, Keiko Okami, and Sabat Islambouli — eventually became among the first licensed female doctors in their respective countries: India, Japan and Syria. What's remarkable about this photo is that in 1885, women in the U.S. still couldn’t vote, nor were they encouraged to learn very much. So how did this trio wind up inside a medical school? And that too, from thousands of miles away? Christopher Woolf credits unsung heroes for making the situation possible: the Quakers, “who believed in women’s rights enough to set up the WMCP way back in 1850 in Germantown.” The first women’s medical college in the world, the WMCP was a magnet for ambitious ladies of all stripes. According to a Drexel archivist he spoke with, India’s first female physician died of tuberculosis at 21, too young to ever practice. As for the other two women in the internet’s favorite 19th century graduation picture, life wasn’t simple going for them either: Islambouli fell off the university’s radar after moving home, an indication that she likely dropped her career. Okami went on to become head of gynecology at a top Tokyo hospital, only to resign when the reigning emperor refused to meet her during a visit to the hospital, because she was a woman. The WMCP graduates are the ones we remember though, and for good reason: in a few years, women doctors are poised to outnumber men around the world.